Hearthstone: Return to Un'Goro Mission – AiPT! You’ve crash landed in Un’Goro Crater. What primordial predicaments await? You wake face-first in the cratered soil, lift your pounding head just enough to discern a figure with its hair in pig-tails crouching at the crater’s edge, poking you repeatedly in the side with a tree branch. “You hit that big head of yours pretty hard, didn’t ya? You’re in the beauteous primordial outback they call Un’Goro Crater. You’re lucky to be alive; your heli-ma-chopper-whatever-you-call-it over there didn’t make out quite as well.” She nodded towards a semicircle of towering kapok trees in the distance where the remains of your Flying Machine — a lopsided tail rotor, charred engine chunks and the melted tube-shape of cockpit glass — lay embedded in the tree canopy in a smoking heap. Borrowed from our Neptulon the Tidehunter custom Tavern Brawl set. Better-fed than his little brother. Nobody tries to make luggage out of this guy. You hear a leathery rasping from the cliff-face above. An enormous Pterrodax who had been camouflaged in the layers of neighboring mountain rock swooped suddenly from its perch. Its vast wings carving scythe-like through the air and a horrible shriek sounding from its sickle-sharp beak and before long it had snatched the piranhas from Brinma’s unsuspecting hands in its talons and zigzagged back the way it had come with an air of gaudy effortlessness. Brinma had lunged at the thing, somehow managed to clasp it by the tail, her stout legs kicking as it carried her off. The two of you land in a quarry with the silk canopy of the pulled parachute draped like enormous bedsheets around your struggling forms. When you finally pull free Brinma whoops and claps her hands together. Brinma rolls her sleeves up. You feel so lightheaded that you can barely stand; you claw at the mountainside, the charcoal-colored steeples of magmatic rock carouseling about your head. Jump to Return to Un’Goro Part Two: The Cave of Rejuvenation. 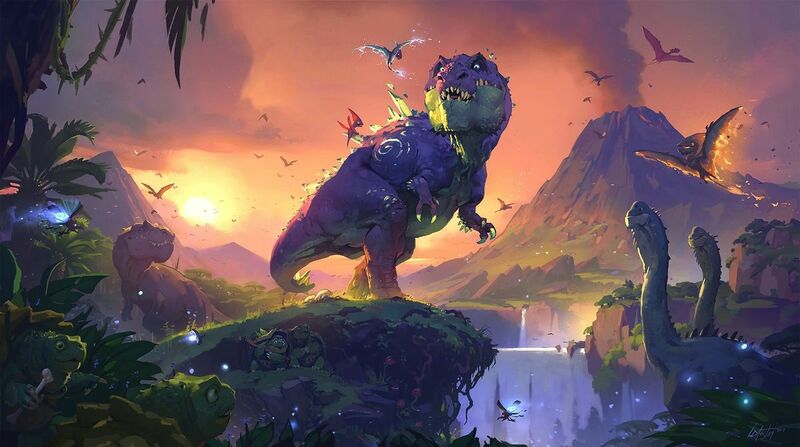 Did you like the first installment of “Return to Un’Goro”? Be sure to check out our custom Tavern Brawl concept, The Elemental Sundering. Are achievements a good thing for video games?